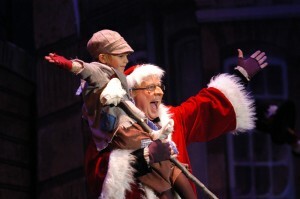 Theatre In The Park's original musical comedy adaptation of A Christmas Carol, based on the novella by Charles Dickens and adapted for the stage by Ira David Wood III, first premiered in 1974. It has been performed each year since. Voted one of the top twenty events in the Southeast, the show has toured to France (twice) and England - playing to sold out houses and standing ovations. One London critic wrote: “Given a West End theatre, this show could run for years.” For two decades, it was a major fundraiser for the Babcock Center Foundation in Columbia, South Carolina. Past cast members include Terrance Mann, Lauren Kennedy, Evan Rachel Wood, Ira David Wood IV, Patrick Stogner, Frankie Muniz, and Michael C. Hall. Approximately 30,000 people annually attend the local production run in Durham and Raleigh, North Carolina. Tickets on sale now to all performances at ticketmaster.com.